With ingenuity and skill, even cast-off materials like cigar boxes were transformed into unique and artistic household items. This skillfully executed stand in the “Crown of Thorns” pattern contains hundreds of hand-carved wood pieces held together without the use of glue or nails. A popular vernacular art form, this style is dubbed Tramp Art because of the romantic association with homeless workmen who might trade this work for food. Martin Cliff, the maker of this piece (and also the Hardanger fiddle in this exhibition), was known as an “artist farmer.” He drew his inspiration from both his Norwegian heritage and the popular arts and crafts of the period. In spite of its name, tramp art was not only made by tramps and other itinerants, but was a popular craft taken up by both hobbyists and professional artisans. Tramp art is the name given to a type of woodworking popular in the United States between about 1865 and 1940, characterized by simple techniques such as chip-carving and whittling and the use of small bits of wood assembled into or applied to larger forms. Very common for small or large pieces like furniture, it was more commonly produced by men.This stand could be use for plants or other purposes in the household. This stand is constructed from ¼” wide strips of unfinished wood reused from old cigar boxes, whittled to points and layered in a lattice formation. Five long vertical strips (willow saplings) protrude from the four-sided pyramidal base to support the top, which is a shallow basket shape lined with cardboard. 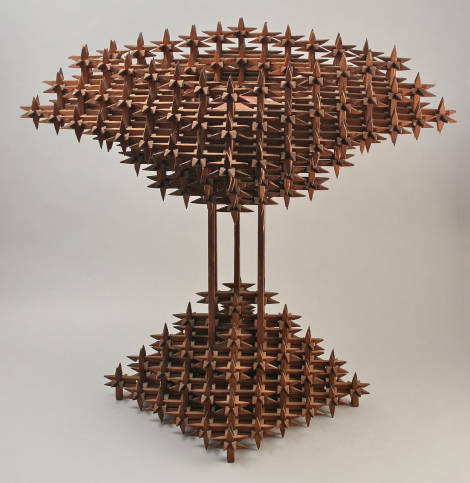 This lattice of pointed bits of wood is a style of tramp art known as “Crown of Thorns.” The use of discarded materials was very common with the make-do practice and today can be interpreted as a form of recycling, concept that did not exist by that period. According to the records of the Mt. Horeb Area Historical Society, this unique design was made by Martin Cliff, descended in the Cliff family of Mt. Horeb. He did not have had a nomadic life, something common among many tramp artists, but he moved from time to time. He was born in March 3, in 1876, son of Siri and Arn Klevgaard, pioneers of the Township of Blue Mounds where he engaged in the carpenter’s trade. In 1904 he got married to Miss Klara Kompelien and set down to a farm near Blue Mounds. In 1911 they bought a new land, establishing in a farm near Sand Rock where they lived until 1936. After that, they moved to Mount Horeb where he worked as treasurer of Lukken school and secretary and treasurer for the Sand Rock Cheese Factory. He also joined the Blue Mounds congregation where he worked serving the community and helping to keep his ethnic roots and traditions, like Norwegian folk music, alive. Cliff also is the author of the Hardanger Fiddle in this exhibit, a fine piece very skillfully hand made with techniques that are completely different from the tramp art carving style, with even higher standards of craftsmanship. Martin Cliff’s Hardanger fiddle is unique to his craft.